Renowned authors and lecturers Susan Easton-Black and George Durrant will begin a four week lecture series in St. George with a kick-off at the Chamber luncheon on January 6, 2016 and continue at the St George Tabernacle on Friday evenings at 7 p.m. through January 29th. Known for their extensive research and knowledge of early LDS Church history, Black was born and reared in Long Beach, California and was the first woman to teach religious studies at Brigham Young University. She was also the first woman to receive the highest academic honor presented to a university faculty member–the Karl G. Maeser Distinguished Faculty Lecturer Award. She has written or co-written more than 60 books and compiled statistical data that filled another 79 volumes. Black’s oratory skills and knowledge of her subject have transcended the classroom. She is bombarded with requests for speaking engagements, giving some 200 of them a year. She has lectured in all 50 states, and has served as a guide for church cruises and tours in the Mediterranean, Jerusalem, Alaska, Caribbean and Baltics. Durrant is a native of American Fork, Utah and has been a popular author, instructor acclaimed speaker. 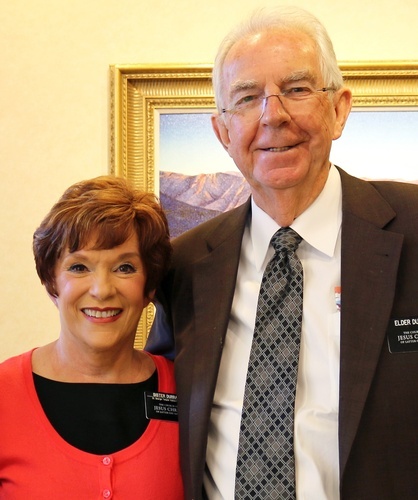 He was professor of religious instruction at BYU for several years, and it was there he met his wife, Susan. He has written or co-authored more than 50 books. He earned his bachelors, masters and doctorate degrees from BYU. Durrant was named Professor of the Year while teaching Religion at BYU, and in a student poll was voted as one of the 15 most influential people at the university. He is a motivational speaker and a master story teller. His pursuits include being a teacher, author, artist, speaker, missionary and, at times, a comedian. He has influenced and touched the hearts of many people through his life work.